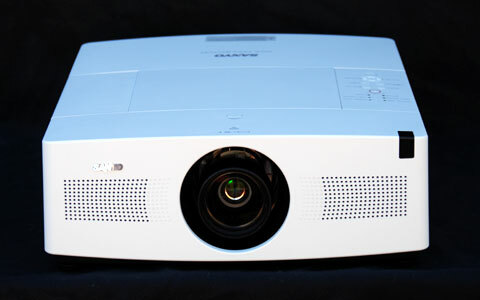 Sanyo is now shipping the PLC-XTC50L, an all new XGA-resolution 5000-lumen LCD installation projector. With some unique features that reduce maintenance costs, it makes products of its type more user friendly than ever before. At 32 lbs, it is somewhat larger and heavier than many other 5000-lumen products on the market. However, several advantages accrue from its size. First, it is remarkably quiet for a 5000-lumen light cannon. But perhaps more importantly, the larger form factor houses a robust light engine with a unique dual-lamp design that offers flexibility and ensures continued seamless operation. Light Engine: XGA, native 4:3, 1" 3LCD with dual 330W lamps. Video Compatibility: 1080p/60/50, 1080i, 720p, 576p, 576i, 480p, 480i. Connection panel. Video signals: One DVI-D digital input, one VGA analog with VGA monitor loop-through, one set of 5 BNCs, one composite video, one S-video. Audio signals: the VGA and BNC ports both have an audio input, whereas the DVI port does not. The composite and S-video jacks share a single audio input. Other connections: one USB, one R/C jack, one control port. Lens and Throw Distance: Varies based on optional lenses. Replacement lamp price: $600 retail. Warranty: Three years, lamp 90 days. I love the design of this projector, too bad it isnt designed for home theatre use. You would think a projector costing this much would have (1920x1080)as opposed to (1600x1200). It's not 1600x1200. That's the max input resolution. The native input is 1024x768. But this projector isn't designed for home theater. It's for NOCs, churches, digital signage, auditoriums, and rental/staging, where the lower cost XGA resolution performs adequately. If you want a bright 1080p home theater projector, check out the Optoma TX1080. Native 1080p at 3600 lumens, plus it only weighs about 13 lbs. Me gusta este proyector, quiero comprar uno para la Iglesia donde colaboro. Donde puedo comprarlo?, solo se compra por Internet o también en frontera? Google Translation: I like this projector , I would buy one for the church where I collaborate. Where I can buy it, only buy online or also at the border ? I am looking for a 5000 and above lumens wireless projectors. Can I get help? How big of an image does this unit project?